Our CO2-Storage tanksare built to store liquid CO2 at a temperature below 0°C under pressure between 12 to 22 bar. Due to the low temperature of liquid CO2, the pressure will remain stable using a high quality vacuum insulation. 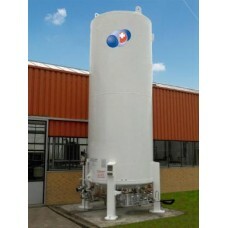 This type of storage tank is built using high grade vacuum. Important to be mentioned is, that this CO2-Tank is equipped with an inner vessel made in stainless steel. This high quality execution will ensure an everlasting quality and maintenance free operation. Most of the well-known soft drinks manufacturer and breweries such as COCA COLA, PEPSI, HEINEKEN, CARLSBERG, etc. are demanding stainless steel execution while performing their audits in validating a possible CO2-supplier.